Wait, that’s so odd. Didn’t the mainstream media last week say that all these migrants were thousands of miles away and that the Republican Party was just airing television spots to scare you. That’s so weird that two groups have arrived in Tijuana already now. Whereas two days ago it was almost 100 LGBTQ migrants, this time it’s another 357 who arrived by bus. Related coverage: <a href="https://thegoldwater.com/news/42108-Caravan-LGBTQ-Honduras-Migrant-Group-Arrives-In-Tijuana-Ready-To-Cross-Video"> Caravan - LGBTQ Honduras Migrant Group Arrives In Tijuana, Ready To Cross (Video)</a>. 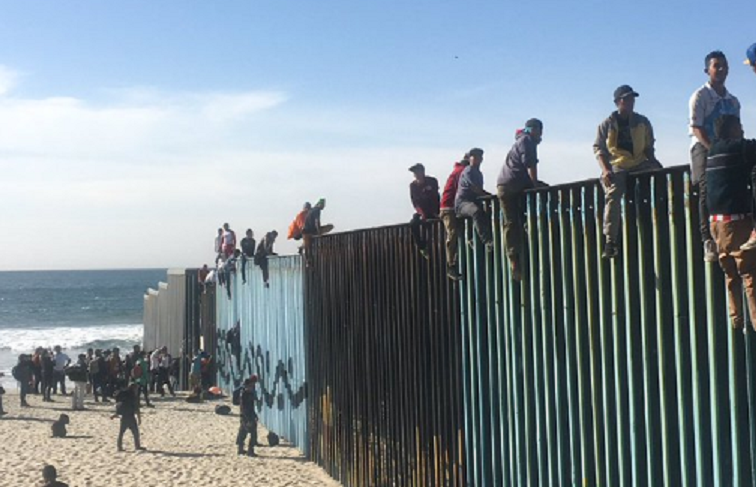 The Central Americans, who could be seen sitting on the border fence between San Diego and Tijuana already, were part of a first group who arrived on in nine buses. More are on the way. The majority of the migrant caravan is still in the Mexican city of Guadalajara, 2400 kilometers south. The group is the first of a total of around 5,000 Latin American migrants. Despite fatigue and illness, they left Mexico City on Saturday and resumed their journey to the United States. A day earlier, a group of about 1,300 migrants had already left the Mexican capital. They spent six days at a sports complex in the east of the city. Related coverage: <a href="http://thegoldwater.com/news/41947-Caravan-Migrants-Admit-I-m-Going-To-Cross-Illegally-And-Try-My-Luck-Over-There"> Caravan – Migrants Admit “I’m Going To Cross Illegally And Try My Luck Over There”</a>. The so-called caravan consists of about 5,000 people from Honduras, Guatemala and El Salvador. They are fleeing the violence of youth gangs and the poor economic situation in their region. The migrants want to apply for asylum in the US. Meanwhile, President Donald Trump sent thousands of soldiers to the border to stop the migrants if they wanted to enter the country illegally. NGOs confirmed that some 2,000 more migrants will arrive by bus in the next few days. When a large group of people cross over your border (illegally) then it's called an invasion. Always defend your country, your homes and loved ones from enemies (foreign or domestic). We only have opportunities for citizens and LEGAL immigrants. IF THESE FUCKERS ARE LETTING THEM IN THEN THIS IS HIGH TREASON AGAINST THE UNITED STATES!!!!!!! WE ARE FACING MASS INVASION!! WHERE IS THE ARMY AND GUARD AND MINUTEMEN WHO ARE SUPPOSE TO BE STOPPING ALL THIS???? ?